The behavior of time delay estimation (TDE) is well understood and therefore attractive to apply in acoustic source localization (ASL). A time delay between microphones maps into a hyperbola. Furthermore, the likelihoods for different time delays are mapped into a set of weighted nonoverlapping hyperbolae in the spatial domain. Combining TDE functions from several microphone pairs results in a spatial likelihood function (SLF) which is a combination of sets of weighted hyperbolae. Traditionally, the maximum SLF point is considered as the source location but is corrupted by reverberation and noise. Particle filters utilize past source information to improve localization performance in such environments. However, uncertainty exists on how to combine the TDE functions. Results from simulated dialogues in various conditions favor TDE combination using intersection-based methods over union. The real-data dialogue results agree with the simulations, showing a 45% RMSE reduction when choosing the intersection over union of TDE functions. Passive acoustic source localization (ASL) methods are attractive for surveillance applications, which are a constant topic of interest. 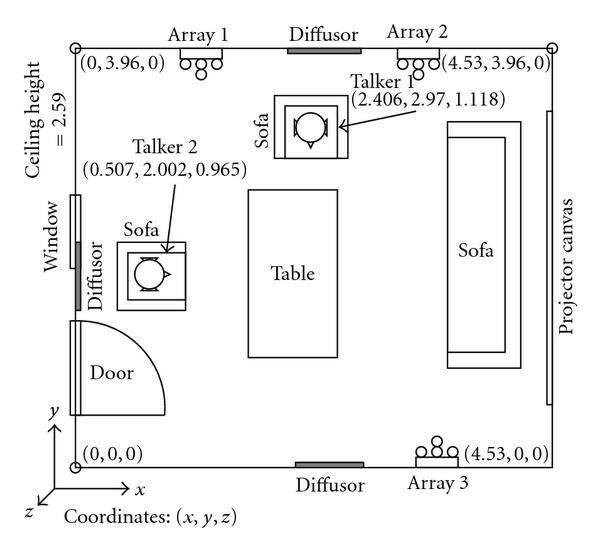 Another popular application is human interaction analysis in smart rooms with multimodal sensors. Automating the perception of human activities is a popular research topic also approached from the aspect of localization. Large databases of smart room recordings are available for system evaluations and development . A typical ASL system consists of several spatially separated microphones. The ASL output is either source direction or location in two- or three-dimensional space, which is achieved by utilizing received signal phase information  and/or amplitude , and possibly sequential information through tracking . Traditional localization methods maximize a spatial likelihood function (SLF)  to locate the source. Localization methods can be divided according to the way the spatial likelihood is formed at each time step. The steered beamforming approach sums delayed microphone signals and calculates the output power for a hypothetical location. It is therefore a direct localization method, since microphone signals are directly applied to build the SLF. Time delay estimation (TDE) is widely studied and well understood and therefore attractive to apply in the source localization problem. The behavior of correlation-based TDE methods has been studied theoretically  also in reverberant enclosures [7, 8]. Other TDE approaches include determining adaptively the transfer function between microphone channels , or the impulse responses between the source and receivers . For more discussion on TDE methods, see . TDE-based localization methods first transform microphone pair signals into a time delay likelihood function. These pairwise likelihood functions are then combined to construct the spatial likelihood function. It is therefore a two-step localization approach in comparison to the direct approach. The TDE function provides a likelihood for any time delay value. For this purpose, the correlation-based TDE methods are directly applicable. A hypothetical source position maps into a time delay between a microphone pair. Since the TDE function assigns a likelihood for the time delay, the likelihood for the hypothetical source position is obtained. From a geometrical aspect, time delay is inverse-mapped as a hyperbola in 3D space. Therefore, the TDE function corresponds to a set of weighted nonoverlapping hyperbolae in the spatial domain. The source location can be solved by utilizing spatially separated microphone pairs, that is, combining pairwise TDE functions to construct a spatial likelihood function (SLF). The combination method varies. Summation is used in [12–14], multiplication is used in [15, 16], and the determinant, used originally to determine the time delay from multiple microphones in , can also be applied for TDE function combination in localization. The traditional localization methods consider the maximum point of the most recent SLF as the source location estimate. However, in a reverberant and noisy environment, the SLF can have peaks outside the source position. Even a moderate increase in the reverberation time may cause dominant noise peaks , leading to the failure of the traditional localization approach . Recently, particle filtering (PF)-based sound source localization systems have been presented [13, 15, 16, 18]. This scheme uses information also from the past time frames to estimate the current source location. The key idea is that spatially inconsistent dominant noise peaks in the current SLF do not necessarily corrupt the location estimate. This scheme has been shown to extend the conditions in which an ASL system is usable in terms of signal to noise ratio (SNR) and reverberation time (T60) compared to the traditional approach . As noted, several ways of combination TDE functions have been used in the past, and some uncertainty exists about a suitable method for building the SLF for sequential 3D source localization. To address this issue, this work introduces a generalized framework for combining TDE functions in TDE-based localization using particle filtering. Geometrically, the summation of TDE functions represents the union of pairwise spatial likelihoods, that is, union of the sets of weighted hyperbolae. Such SLF does have the maximum value at the correct location but also includes the unnecessary tails of the hyperbolae. Taking the intersection of the sets reduces the unnecessary tails of the hyperbolae, that is, acknowledges that the time delay is eventually related only to a single point in space and not to the entire set of points it gets mapped into (hyperbola). TDE combination schemes are compared using a simulated dialogue. The simulation reverberation time (T60) ranges from 0 to 0.9 second, and the SNR ranges from to dB. Also real-data from a dialogue session is examined in detail. The rest of this article is organized as follows: Section 2 discusses the signal model and TDE functions along with signal parameters that affect TDE. Section 3 proposes a general framework for combining the TDE functions to build the SLF. Section 4 categorizes localization methods based on the TDE combination operation they apply and discusses how the combination affects the SLF shape. Iterative localization methods are briefly discussed. Particle filtering theory is reviewed in Section 5 for sequential SLF estimation and localization. In Section 6, simulations and real-data measurements are described. Selected localization methods are compared in Section 7. Finally, Sections 8 and 9 conclude the discussion. where is the speed of sound, and is the Euclidean norm. Figure 1(a) illustrates propagation delay from source to microphones, using a 2D simplification. where is the sampling frequency, and denotes rounding. Conversely, a delay between microphone pair defines a set of 3D locations forming a hyperbolic surface that includes the unique location . The geometry is illustrated in Figure 1(b), where hyperbolae related to TDOA values are illustrated. where is a complex conjugate transpose of the DFT of the th microphone signal, is discrete frequency, denotes inverse DFT, and is a weighting function, see . Phase transform (PHAT) weighting causes sharper peaks in the TDE function compared to the nonweighted GCC and is used by several TDE-based localization methods, including the steered response power using phase transform (SRP-PHAT) . An example of TDE function is displayed in Figure 1(c). Other weighting schemes include the Roth, Scot, Eckart, the Hannan-Thomson (maximum likelihood) , and the Hassab-Boucher methods . Other applicable TDE functions include the modified average magnitude difference function (MAMDF) . 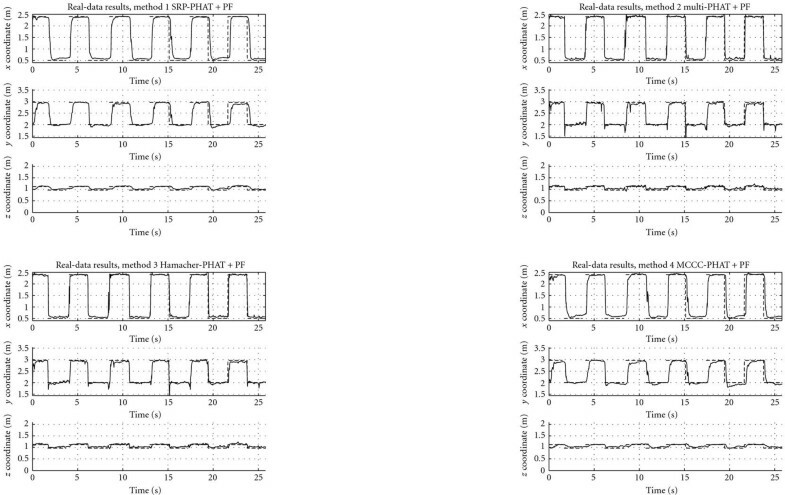 Recently, time frequency histograms have been proposed to increase TDE robustness against noise . For a more detailed discussion on TDE refer to . The evaluation of different TDE methods and GCC weighting methods is, however, outside the scope of this work. Hereafter, the PHAT-weighted GCC is utilized as the TDE weighting function since it is the optimal weighting function for a TDOA estimator in a reverberant environment . The correlation-based TDOA is defined as the peak location of the GCC-based TDE function . Three distinct SNR ranges (high, low, and the transition range in between) in TDOA estimation accuracy have been identified in a nonreverberant environment . In the high SNR range, the TDOA variance attains the Cramer-Rao lower bound (CRLB) . In the low SNR range, the TDE function is dominated by noise, and the peak location is noninformative. In the transition range, the TDE peak becomes ambiguous and is not necessary related to the correct TDOA value. TDOA estimators fail rapidly when the SNR drops into this transition SNR range . According to the modified Ziv-Zakai lower bound, this behavior depends on time-bandwidth product, bandwidth to center frequency ratio, and SNR . In addition, the CRLB depends on the center frequency. In a reverberant environment the correlation-based TDOA performance is known to rapidly decay when the reverberation time (T60) increases . The CRLB of the correlation-based TDOA estimator in the reverberant case is derived in  where PHAT weighting is shown to be optimal. In that model, the signal to noise and reverberation ratio (SNRR) and signal frequency band affect the achievable minimum variance. The SNRR is a function of the acoustic reflection coefficient, noise variance, microphone distance from the source, and the room surface area. where represents conditional likelihood, normalized between . Figure 1(d) displays the pairwise SLF of the TDE measurement displayed in Figure 1(c). Equation (7) can be interpreted as a likelihood of a source having location given the measurement . The pairwise SLF consists of weighted nonoverlapping hyperbolic objects and therefore has no unique maximum. A practical solution to reduce the ambiguity of the maximum point is to utilize several microphone pairs. The combination operator used to perform fusion between these pairwise SLFs influences the shape of the resulting SLF. Everything else except the source position of each of the hyperboloid's shape is nuisance. Such operations include -norm and -norm. -norm operations between two sets represent the union of sets and have the property . The most common -norm operation is summation. Other well- known -norm operations include the Euclidean distance and maximum value. where is a parameter. Note that the multiplication is a special case of (12) when . Figure 2 illustrates the combination of two likelihood values, A and B. The likelihood values are displayed on the axes. The leftmost image represents summation, the middle represents product and the rightmost is Hamacher -norm ( ). The contour lines represent the joint likelihood. The summation is the only -norm here. In general, the -norm is large only if all likelihoods are large. Similarly, the -norm can be large even if some likelihood values are small. where each microphone pair belongs to a microphone pair group , and represents all the TDE functions of the group. There exists unique microphone pairs in the set of all pairs. Sometimes partitioning the set of microphones into groups or arrays before pairing is justified. 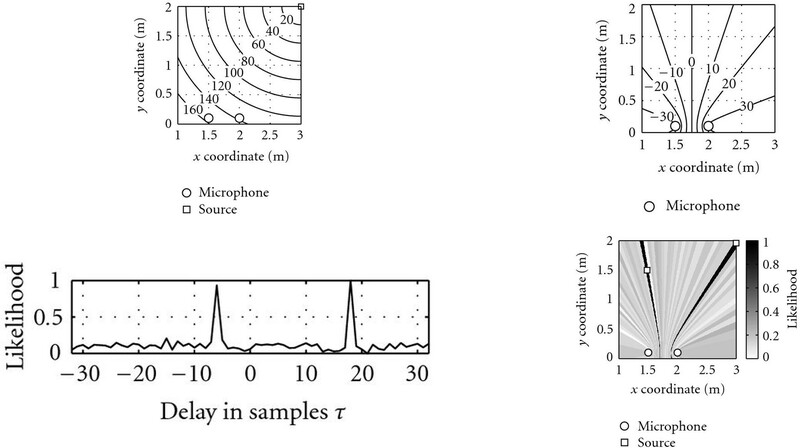 The signal coherence between two microphones decreases as microphone distance increases  which favors partitioning the microphones into groups with low sensor distance. Also, the complexity of calculating all pairwise TDE function values is , which is lower for partitioned arrays. Selecting too small sensor separation may lead to over-quantization of the possible TDOA values where only a few delay values exist, see (5). Several TDE-based combination schemes exist in the ASL literature. The most common method is the summation. This section presents four distinct operations in the generalized framework. Every high value of the pairwise SLF is present in the resulting SLF since the sum represents a union of values. In a multiple source situation with more than two sensors, this approach generates high probability regions outside actual source positions, that is, ghosts. See Figure 3(a) for illustration, where ghosts appear, for example, at x, y coordinates and . A two-source example scenario with three microphone pairs is illustrated. The source coordinates are and . Two combination operators sum and product are used to produce two separate spatial likelihood functions (SLFs). The SLF contours are presented in panels (d) and (h). Circle and square represent microphone and source locations, respectively. Panels (a) and (e) illustrate the resulting 2D SLF, produced with the sum and product operations, respectively. 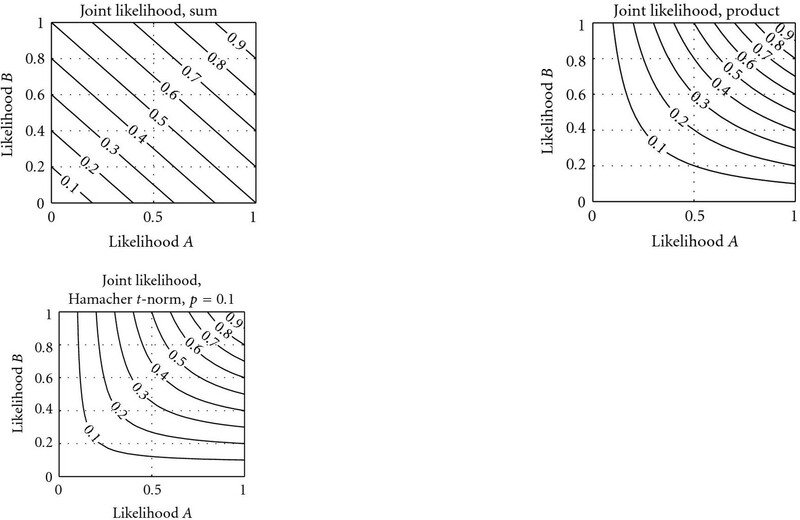 The marginal distributions of the SLFs are presented in panels (b) and (c) for the sum, and (f) and (g) for the product. The panel (a) distribution has ghosts which are the result of summed observations, see example ghost at . Also, the marginal distributions are not informative. In the panel (e), SLF has sharp peaks which are in the presence of the actual sound sources. The marginal distributions carry source position information, though this is not guaranteed in general. This approach outputs the common high likelihood areas of the measurements, and so the unnecessary peaks of the SLF are somewhat reduced. The ghosts experienced in the SRP-PHAT method are eliminated in theory by the intersection-based combination approach. This is illustrated in Figure 3(b). The SLF has two distinct peaks that correspond to the true source locations. Several other methods that have the properties (9)–(11) can be used to combine likelihoods. These methods include parameterized -norms and -norms . Here, the Hamacher -norm (12) is chosen because it is relatively close to the product and represents the intersection of sets. The Hamacher -norm is defined as a dual norm, since it operates on two inputs. where is abbreviated notation of , that is, the PHAT-weighted GCC value from the th microphone pair for location , where is the total number of pairs, and is the Hamacher -norm (12). Since the norm is commutative, the TDE measurements can be combined in an arbitrary order. Any positive value can be chosen, but values were empirically found to produce good results. Note that multi-PHAT is a special case of Hamacher-PHAT when . The MCCC method is argued to remove the effect of a channel that does not correlate with the other channels . This method does not satisfy the monotonicity assumption (10). Also, the associativity (11) does not follow in arrays larger than three microphones. Four different TDE combination schemes were discussed, and existing localization methods were categorized accordingly. Figure 3 displays the difference between the intersection and the union of TDE function in localization. The SLF produced with the Hamacher -norm differs slightly from the multiplication approach and is not illustrated. Also, the SLF produced with the MCCC is relatively close to the summation, as seen later in Figure 10. The intersection results in the source location information. The union contains the same information as the intersection but also other regions, such as the tails of the hyperbolae. This extra information does not help localization. In fact, likelihood mass outside true source position increases the estimator variance. However, this extra likelihood mass can be considered in other applications, for example, to determine the speaker's head orientation . A straightforward but computationally expensive approach for source localization is to exhaustively find the maximum value of the SLF. The SRP-PHAT is perhaps the most common way of building the SLF so a lot of algorithms, including the following ones, have been developed to reduce the computational burden. A stochastic  and a deterministic  ways of reducing the number of SLF evaluations have been presented. These methods iteratively reduce the search volume that contains the maximum point until the volume is small enough. In , the fact that a time delay is inverse-mapped into multiple spatial coordinates was utilized to reduce the number of SLF grid evaluations by considering only the neighborhood of the highest TDE function values. In , the SLF is maximized initially at low frequencies that correspond to large spatial blocks. The maximum-valued SLF block is selected and further divided into smaller blocks by increasing the frequency range. The process is repeated until a desired accuracy is reached. In the Bayesian framework, the SLF represents the noisy measurement distribution at time frame , where represents measurement and state. In the previous section, several means of building the measurement distribution were discussed. The next step is to estimate the source position using the posterior distribution . The subindices emphasize that the distribution includes all the previous measurements and state information, unlike the iterative methods discussed above. The state represents a priori information. The first measurement is available at time frame = 1.
where the nominator is a normalizing constant. For each time frame the two steps (20) and (21) are repeated. where the scalar weights sum to unity, and is the Dirac's delta function. In this work, the particles are 3D points in space. The specific PF method used is the sampling importance resampling (SIR), described in Algorithm 1. The algorithm propagates the particles according to the motion model which is here selected as a dual-Gaussian distribution (Brownian motion). Both distributions are centered on the current estimate with standard deviations of and , (see Algorithm 1 Line 3). The new weights are calculated from the SLF on Line 4. Algorithm 1: SIR algorithm for particle filtering . A dialogue situation between talkers is analyzed. The localization methods already discussed are compared using simulations and real-data measurements performed in a room environment. The simulation is used to analyze how the different TDE combination methods affect the estimation performance when noise and reverberation are added. The real-data measurements are used to verify the performance difference. The meeting room dimensions are 4.53 3.96 2.59 m. The room layout and talker locations are illustrated in Figure 4. The room contains three identical microphone arrays. Each array consists of four microphones, and their coordinates are given in Table 1. The real room is additionally equipped with furniture and other small objects. Microphone geometry for the arrays is given for each microphone (mm). The coordinate system is the same used in Figure 4. A diagram of the meeting room. The room contains furniture, a projector canvas, and three diffusors. Three microphone arrays are located on the walls. Talker positions are given [ ], and they are identical in the simulations and in the real-data experiments. The measured reverberation time T60 of the meeting room is 0.25 seconds, obtained with the maximum-length sequence (MLS) technique  using the array microphones and a loudspeaker. A sampling rate of 44.1 kHz is used, with 24 bits per sample, stored in linear PCM format. The array microphones are Sennheiser MKE 2-P-C electret condenser microphones with a 48 V phantom feed. A 26 second dialogue between human talkers was recorded. The talkers uttered a predefined Finnish sentence and repeated the sentence in turns for six times. The SNR is estimated to be at least 16 dB in each microphone. The recording signal was manually annotated into three different classes "talker 1", "talker 2", and "silence". Figure 5 displays the signal and its annotation. The reference position is measured from the talker's lips and contains some errors due to unintentional movement of the talker and the practical nature of the measurement. The real-data dialogue signal is plotted from one microphone. The signal is annotated into "talker 1", "talker 2", and "silence" segments. The annotation is also illustrated. The talkers repeated their own sentence. The meeting room is simulated using the image method . The method estimates the impulse response between the source and receiving microphone . The resulting microphone signal is calculated using (1). The reverberation time (T60) of the room is varied by changing the reflection coefficient of the walls , and the ceiling and floor which are related by . The coefficient determines the amount of sound energy reflected from a surface. Recordings with 10 different T60 values between 0 and 0.9 second are simulated with SNR ranging from dB to dB in 0.8 dB steps for each T60 value. The simulation signals consisted of 4 seconds of recorded babble. The active talker switches from talker 1 to talker 2 at time 2.0 seconds. The total number of recordings is 510. The T60 values are [0, 0.094, 0.107, 0.203, 0.298, 0.410, 0.512, 0.623, 0.743, 0.880]. These are median values of channel T60 values calculated from the impulse response using Schroeder integration . (1)SRP-PHAT PF: PHAT-weighted GCC values are summed to form the SLF (14), and SIR-PF algorithm is applied. (2)Multi-PHAT PF: PHAT-weighted GCC values are multiplied together to form the SLF (15), and SIR-PF algorithm is applied. Hamacher-PHAT PF: PHAT-weighted GCC values are combined pairwise using the Hamacher -norm (16), with parameter value . The SIR-PF algorithm is then applied. (4)MCCC PF: PHAT-weighted GCC values are formed into a matrix (17), and the determinant operator is used to combine the pairwise array TDE functions (18). Multiplication is used to combine the resulting three array likelihoods together. In the simulation, multiplication produced better results than using the determinant operator for the array likelihoods. The SIR-PF algorithm is also applied. The particle filtering algorithm discussed in Section 5 (SIR-PF) is used with 5000 particles. The systematic resampling was applied due to its favorable resampling quality and low computational complexity . The particles are confined to room dimensions and in the real-data analysis also between heights of 0.5–1.5 m to reduce the effects of ventilation noise. The 5000 particles have a Brownian motion model, with empirically chosen standard deviation values 0.05 and 0.01 m for the simulations and real-data experiments, respectively. The Brownian motion model was selected since the talkers are somewhat stationary. Different dynamic models could be applied if the talkers move .The particles are uniformly distributed inside the room at the beginning of each run, that is, the a priori spatial likelihood function is uniform. where is the frame index, and represents the number of frames. In the real-data analysis, the time frames annotated as "silence" are omitted. 0.3 second of data is omitted from the beginning of the simulation and after the speaker change to reduce the effects of particle filter convergence on the RMS error. Omitting of nonspeech frames could be performed automatically with a voice activity detector (VAD), see for example . Results for the simulations using the four discussed ASL methods are given in Figures 6 and 7, for talker locations 1 and 2, respectively. The subfigures (a) to (d) represent the RMS error contours for each of the four methods. The x-axis displays the SNR of the recording, and y-axis displays the reverberation time (T60) value of the recording. A large RMS error value indicates that the method does not produce meaningful results. For all methods, talker location 1 results in better ASL performance, than location 2. The results of location 1 are examined in detail. The multi- and Hamacher-PHAT (intersection) methods clearly exhibit better performance. At 14 dB SNR, the intersection methods have RMSE 20 cm when reverberation time T60 0.4 second. 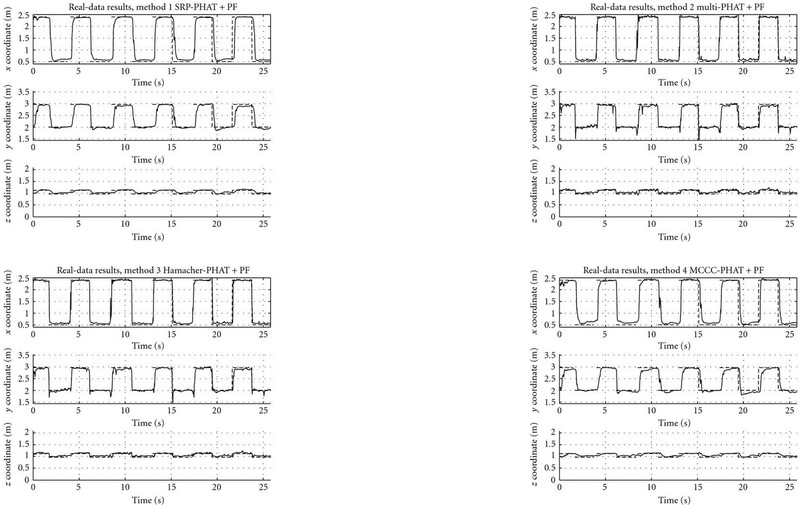 In contrast, the SRP- and MCCC-PHAT attain the same error with T60 0.2 second. The results for talker location 2 are similar, except that there exists a systematic increase in RMS error. The decrease in performance is mainly caused by the slower convergence of the particle filter. At the start of the simulation, talker 1 becomes active and all of the particles are scattered randomly inside the room, according to the a priori distribution. When talker 2 becomes active and talker 1 silent, most of the particles are still at talker 1 location, and only a percent of the particles are scattered in the room. Therefore, the particle filter is more likely to converge faster to talker 1 than to talker 2, which is seen in the systematic increase of RMSE. Evident in larger area of RMS error contour below 0.2 m multi- and Hamacher-PHAT increase the performance both in noisy and reverberant environments compared to SRP- and MCCC-PHAT. Since the location estimation process utilizes a stochastic method (PF), the calculations are repeated 500 times and then averaged. The averaged results are displayed for the four methods in Figure 8. The location estimates are plotted with a continuous line, and the active talker is marked with a dashed line. All methods converge to both speakers. The SRP-PHAT and MCCC-PHAT behave smoothly. 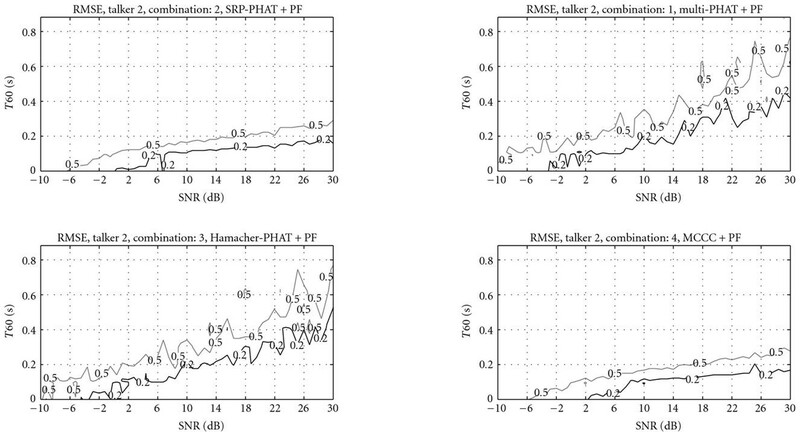 The multi-PHAT and Hamacher-PHAT adapt to the switch of the active speaker more rapidly than other methods and also exhibit rapid movement of the estimator compared to the SRP- and MCCC-PHAT methods. 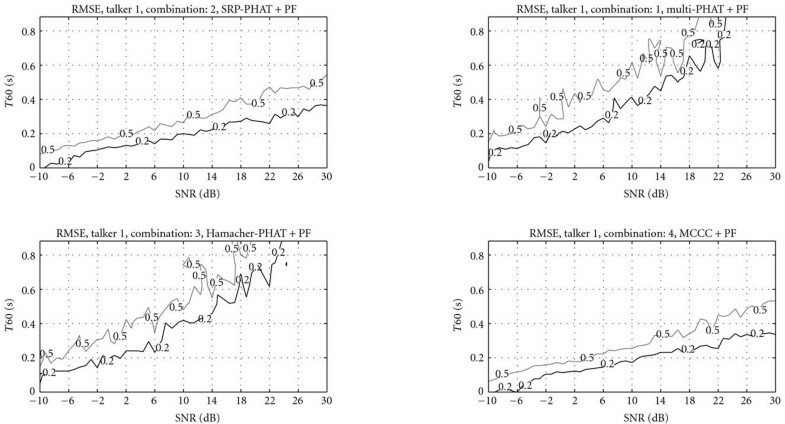 The RMS errors of the real-data segment are SRP-PHAT: 0.31 m, MCCC-PHAT: 0.29 m, Hamacher-PHAT: 0.14 m, and multi-PHAT: 0.14 m. The performance in the real-data scenario is further illustrated in Figure 9. The percentage of estimates outside a sphere centered at the ground truth location of both talkers is examined. The sphere radius is used as a threshold value to determine if an estimate is an outlier. The Hamacher-PHAT outperforms the others methods. 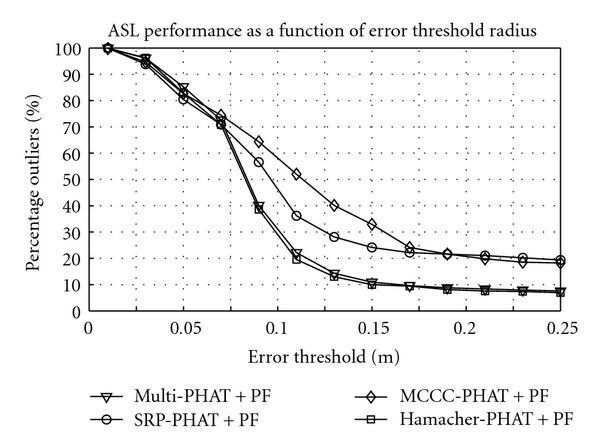 SRP-PHAT has 80.6% of estimates inside the 25 cm error threshold, the MCCC-PHAT has 81.8%, the Hamacher-PHAT has 93.1%, and the multi-PHAT has 92.4%. The figure displays the percentage of the estimates ( y -axis) falling outside of a sphere centered at the active speaker. The sphere radius is plotted on the x-axis (threshold value). The marginal spatial likelihood functions from real-data recording are presented. The talker locations are marked with a square symbol (" "). The z-axis is the marginalized spatial likelihood over the whole conversation. In the RMSE sense (24), the likelihood mass is centered around the true position in all cases. The results agree with the simulations. The reason for the performance difference can be further examined by looking at the SLF shape. For this analysis, the SLFs are evaluated with a uniform grid of 5 cm density over the whole room area at three different elevations (0.95, 1.05, and 1.15 m). 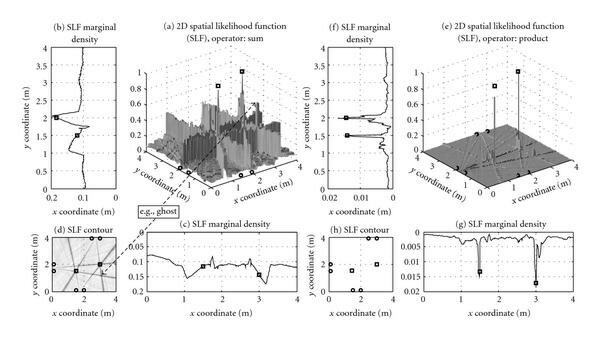 The marginal SLF is generated by integrating SLFs over the z-dimension and time. The normalized marginal spatial likelihood functions are displayed in Figure 10. In the RMSE sense (24), the likelihood mass is centered around the true position in all cases. However, Hamacher- and multi-PHAT likelihood distributions have greater peakiness with more likelihood mass concentrated around the talker. The SRP-PHAT and MCCC-PHAT have a large evenly distributed likelihood mass, that is, large variance. Note that only a single talker was active at a time, and the marginal SLFs are multimodal due to integration over the whole recording time. The simulations use the image method which simplifies the acoustic behavior of the room and source. The simulations neglect that the reflection coefficient is a function of the incident angle and frequency, and that the air itself absorbs sound . The effect of the latter becomes more significant in large enclosures. The human talker is acoustically modeled as a point source. This simplification is valid for the simulations, since the data is generated using this assumption. In the real-data scenario, the sound does not originate from a single point in space, but rather from the whole mouth area of the speaker. Human speech is also directive, and the directivity increases at higher frequencies . Due to the above facts, the simulation results presented here are not absolute performance values and can change when the system is applied in a real environment. However, the same exact simulation data was applied when comparing the methods. The results, therefore, give information about the relative performance of the methods under the simulation assumptions. The methods were tested on a real recorded dialogue. All the methods were capable of determining the location of the sound source with varying accuracy. It is likely that the manual annotation and reference measurements contain some errors that affect the reported performance. The only difference between the methods was the way the spatial likelihood function was constructed from the pairwise microphone TDE functions. Since the intersection-based TDE combination methods have better variance, they offer more evidence for the sound source and therefore their convergence is also faster. 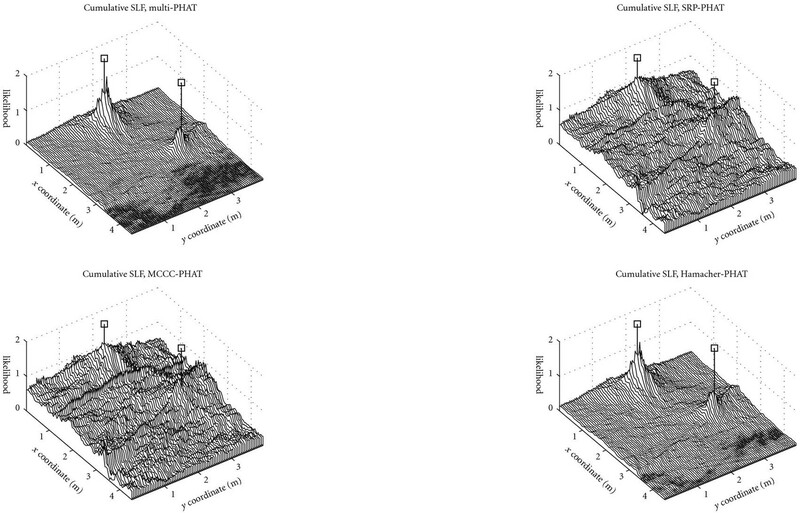 This article discusses a class of acoustic source localization (ASL) methods based on a two-step approach where first the measurement data is transformed using a time delay estimation (TDE) function and then combined to produce the spatial likelihood function (SLF). The SLF is used in a sequential Bayesian framework to obtain the source position estimate. A general framework for combining the TDE functions to construct the SLF was presented. Combining the TDE functions using a union operation distributes more likelihood mass outside the source position compared to the intersection of TDE functions. The variance of the spatial likelihood distribution that is constructed with the intersection is thus lower. The particle filter converged faster with a low variance spatial likelihood function than a large variance likelihood function. This is evident in the simulation and real-data results. Four different schemes to build the SLF from PHAT-weighted GCC values are implemented, specifically: multiplication, Hamacher -norm (generalized multiplication), summation, and a determinant-based combination. The first two methods represent intersection, the summation represents union, and the determinant falls out of the presented TDE function categorization. In the experiments, the intersection methods gave the best results under different SNR and reverberation conditions using a particle filter. The location RMS error was reduced by 45% by preferring the intersection over the union when constructing the SLF. The authors wish to thank Dr. Eric Lehmann, for providing a simulation tool for the image method simulations, Sakari Tervo (M.S.) for assistance, Mikko Parviainen (M.S. ), and the anonymous reviewers for their comments and suggestions.